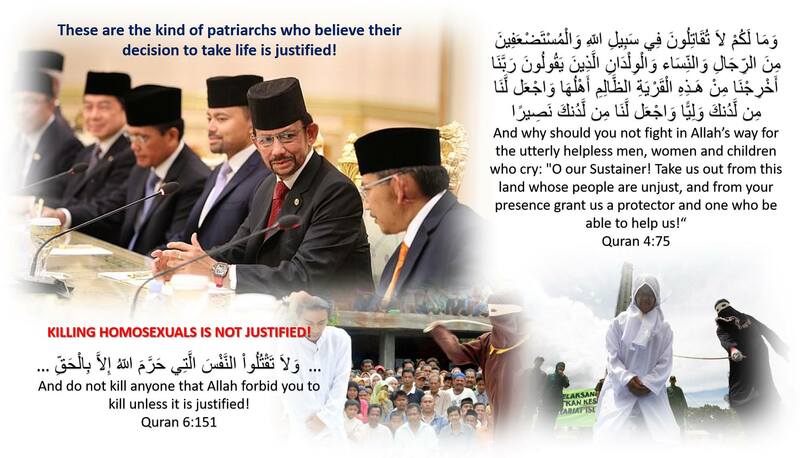 Compassion-centred Islam / Al-Ghurbaah Foundation condemn the recent decision of the Sultan of Brunei to go ahead with the implementation of a draconian new penal code based on defunct Shariah law that does not uphold the Quranic values of mercy and compassion. The law will be implemented from the 3rd of April 2019, which will result in the public stoning of homosexuals and adulterers as well as the amputation of a hand and a foot from thieves. The consumption of alcohol is already declared illegal and punishable by flogging. Although we may or may not agree on some of these issues, we must agree that we as Muslims cannot compromise on our levels of compassion, mercy and forgiveness which is central to Islam. The Sultan of Brunei is one of the world’s richest leaders with a personal wealth of about $20bn and has held the throne since 1967. This status he holds obviously comes with a lot of power and privilege. We therefore appeal to the conscience of the Sultan of Brunei to stop these punitive forms of punishment and the perpetuation of negative stereotyping of Muslims. This retrogressive thinking will only reinforce the already escalating Islamophobia in the world. We are also appealing to our multi-faith partners to support us in fighting Islamic extremism in the same way you have supported us against the terrorist Islamophobic attacks recently in Christchurch. It is high time that we deal with the ignorance around sexual orientation and gender identity which the Quran is silent about. There is a huge difference between homosexual behaviour, motivated by the abuse of power in the infamous story of Sodom and Gomorrah, and sexual orientation and gender identity. Surely there were earlier scholars such as Abu Bakr Al-Jassas (d. 981 AD/370 AH) who argued that the Hadiths on the killing of homosexuals ‘are not reliable by any means, and no legal punishment can be prescribed based on them.’ The contemporary Mauritanian scholar, Mohamed El-Moctar El-Shinqiti argued that there is no legal punishment stated in the Qur’an for homosexuality and that it is not reported that the Prophet Muhammad (pbuh) had ever punished anyone for homosexual acts. There is no authentic Hadith reported from the Prophet Muhammad (pbuh) prescribing a punishment for homosexual acts. Hadith scholars such as Al-Bukhari, Yahya ibn Ma`in, An-Nasa’i, Ibn Hazm, Al-Tirmidhi, and others have all declared that the Hadith around the punishment of homosexuals were weak and fabricated. Umar ibn Al-Khattab during his caliphate stopped the cutting of hands and feet of those who were stealing since he observed that most of them were stealing out of necessity. His argument was that the value of mercy, compassion and forgiveness reign far more supreme than harsh punishment. The Prophet Muhammad (pbuh) said: “Islam started as a strange thing, and it will return as a strange thing just as it started”. Is Brunei’s version of Islam the kind of Islam we want to see in the world while the Prophet Muhammad (pbuh) fought tirelessly to restore human dignity? Let us as Muslims continue to engage with the world through the lens of mercy and compassion just as the beginning of every Surah in the Quran (except for one) instructs us to do! We are appealing to the Sultan of Brunei to rethink his decision and the consequences these unjust laws would have on innocent people. See also Ani Zonnenveld of Muslims for Progressive Values‘s op-ed here.